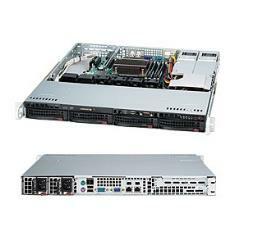 This is a low cost Xeon E3 system in 1U space with 4 hot-swap HDD, best fit for web, email, small database applications. Intel® Xeon® E3-1200 v3 series, Intel® 4th Gen Core i3, Intel® Pentium® and Celeron processors. Supports up to 32GB of Unbuffered ECC DDR3 1333/1600MHz memory. 2-channel for best performance. 1 PCI-e x8 3.0 slot (on X16 socket). 6 Serial ATA (SATA) ports - 2 of 6Gbps and 4 of 3Gbps (Intel C222). 2x Gigabit Ethernet (1x via Intel® i217LM + 1x via Intel® i210AT), Supports 1000BASE-T, 100base-T RJ45 output. Up to 8 USB (Universal Serial Bus) ports - 2x USB 3.0 ports (1 Type-A, 1 via header), 6x USB 2.0 ports (4 rear, 2 via header). VGA - BMC integrated Aspeed AST2400 DB9..
IPMI 2.0 with Dedicated LAN port RJ45, remote KVM, remote management. 1U case with redundant 400W power supply, 80+ gold level. 4 of 3.5" HDD hot-swap bays ( w/ backplane SAS/SATA). 1 slim floppy bay, 1 slim DVD bay. Width: 16.7 in. Height: 1.7 in. Depth: 19.5 in.